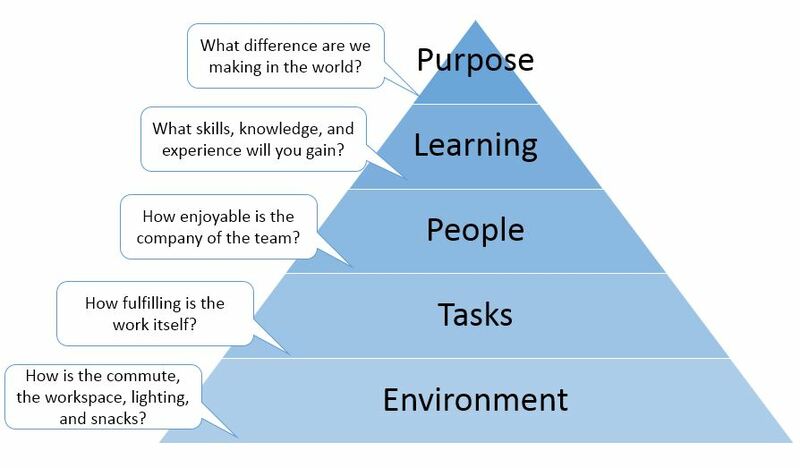 Does your job fulfill the career Hierarchy of Needs? Among the many first world problems readers of this blog will face is the challenge of finding a rewarding career. With apologies to Maslow, I’ve created a hierarchy of needs for careers. You may find this helpful when comparing options to change jobs within a company or between organizations. Remember that just like in other areas of consumer behavior, career decisions are about making trade-offs. Is a shorter commute “worth” doing more PowerPoint slides? Would you give up your dynamic and cohesive team for the chance to make a more tangible positive difference to society? Keep in mind that the items at the top of the pyramid tend to take a longer time to become evident. My last caveat before explaining the career hierarchy of needs is what you won’t see on the list. Compensation and title/status are not part of this hierarchy for two reasons: first, adequate compensation and title are pre-requisites for any job that an established professional would consider. Second, as authors like Daniel Pink and Andy LaCivita have illustrated, throwing more money at a person in a marginally tolerable role is only a temporary fix. (top) Purpose – what difference are we making in the world? Learning – what skills, knowledge, and experience will you gain? People – how enjoyable is the company of the team? Tasks – how fulfilling is the work itself? (bottom) Work environment – how is the commute, the workplace, the lighting, the snacks? Try using this set of attributes to plan your next career move, or to start a discussion among your team about how to improve the current environment. If you have feedback about what I’ve omitted, or what doesn’t belong, leave a comment. Next Post There are only 4 jobs in business: which are you pursuing?